Hans Christian Andersen range of adult stories never ceases to surprise me. The Thorny Road of Honor , published in 1874 is a deeply moving essay about how misunderstood some of the bold innovators throughout history have been, their accomplishments realized only after traveling a truly "thorny road." An old story yet lives of the "Thorny Road of Honor," of a marksman, who indeed attained to rank and office, but only after a lifelong and weary strife against difficulties. Who has not, in reading this story, thought of his own strife, and of his own numerous "difficulties?" The story is very closely akin to reality; but still it has its harmonious explanation here on earth, while reality often points beyond the confines of life to the regions of eternity. The history of the world is like a magic lantern that displays to us, in light pictures upon the dark ground of the present, how the benefactors of mankind, the martyrs of genius, wandered along the thorny road of honor. From all periods, and from every country, these shining pictures display themselves to us. Each only appears for a few moments, but each represents a whole life, sometimes a whole age, with its conflicts and victories. Let us contemplate here and there one of the company of martyrs—the company which will receive new members until the world itself shall pass away. We look down upon a crowded amphitheatre. Out of the "Clouds" of Aristophanes, satire and humor are pouring down in streams upon the audience; on the stage Socrates, the most remarkable man in Athens, he who had been the shield and defence of the people against the thirty tyrants, is held up mentally and bodily to ridicule—Socrates, who saved Alcibiades and Xenophon in the turmoil of battle, and whose genius soared far above the gods of the ancients. He himself is present; he has risen from the spectator's bench, and has stepped forward, that the laughing Athenians may well appreciate the likeness between himself and the caricature on the stage. There he stands before them, towering high above them all. Thou juicy, green, poisonous hemlock, throw thy shadow over Athens—not thou, olive tree of fame! Seven cities contended for the honor of giving birth to Homer—that is to say, they contended after his death! Let us look at him as he was in his lifetime. He wanders on foot through the cities, and recites his verses for a livelihood; the thought for the morrow turns his hair gray! He, the great seer, is blind, and painfully pursues his way—the sharp thorn tears the mantle of the king of poets. His song yet lives, and through that alone live all the heroes and gods of antiquity. One picture after another springs up from the east, from the west, far removed from each other in time and place, and yet each one forming a portion of the thorny road of honor, on which the thistle indeed displays a flower, but only to adorn the grave. The camels pass along under the palm trees; they are richly laden with indigo and other treasures of value, sent by the ruler of the land to him whose songs are the delight of the people, the fame of the country. He whom envy and falsehood have driven into exile has been found, and the caravan approaches the little town in which he has taken refuge. A poor corpse is carried out of the town gate, and the funeral procession causes the caravan to halt. The dead man is he whom they have been sent to seek—Firdusi—who has wandered the Thorny road of honor even to the end. The African, with blunt features, thick lips, and woolly hair, sits on the marble steps of the palace in the capital of Portugal, and begs. He is the submissive slave of Camoens, and but for him, and for the copper coins thrown to him by the passers-by, his master, the poet of the "Lusiad," would die of hunger. Now, a costly monument marks the grave of Camoens. There is a new picture. Behind the iron grating a man appears, pale as death, with long unkempt beard. "I have made a discovery," he says, "the greatest that has been made for centuries; and they have kept me locked up here for more than twenty years!" "A madman," replies the keeper of the madhouse. "What whimsical ideas these lunatics have! He imagines that one can propel things by means of steam." It is Solomon de Cares, the discoverer of the power of steam, whose theory, expressed in dark words, is not understood by Richelieu; and he dies in the madhouse. Here stands Columbus, whom the street boys used once to follow and jeer, because he wanted to discover a new world; and he has discovered it. Shouts of joy greet him from the breasts of all, and the clash of bells sounds to celebrate his triumphant return; but the clash of the bells of envy soon drowns the others. The discoverer of a world—he who lifted the American gold land from the sea, and gave it to his king—he is rewarded with iron chains. He wishes that these chains may be placed in his coffin, for they witness to the world of the way in which a man's contemporaries reward good service. One picture after another comes crowding on; the thorny path of honor and of fame is over-filled. Here in dark night sits the man who measured the mountains in the moon; he who forced his way out into the endless space, among stars and planets; he, the mighty man who understood the spirit of nature, and felt the earth moving beneath his feet—Galileo. Blind and deaf he sits—an old man thrust through with the spear of suffering, and amid the torments of neglect, scarcely able to lift his foot—that foot with which, in the anguish of his soul, when men denied the truth, he stamped upon the ground, with the exclamation, "Yet it moves!" Here stands a woman of childlike mind, yet full of faith and inspiration. She carries the banner in front of the combating army, and brings victory and salvation to her fatherland. The sound of shouting arises, and the pile flames up. 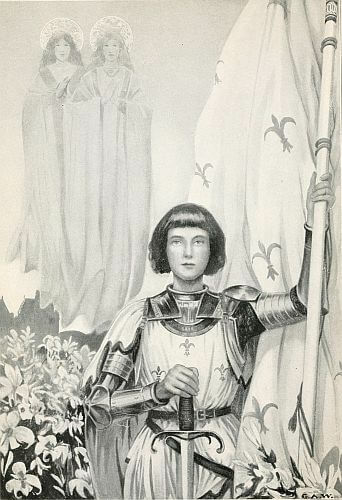 They are burning the witch, Joan of Arc. Yes, and a future century jeers at the White Lily. Voltaire, the satyr of human intellect, writes "La Pucelle." At the Thing or Assembly at Viborg, the Danish nobles burn the laws of the king. They flame up high, illuminating the period and the lawgiver, and throw a glory into the dark prison tower, where an old man is growing gray and bent. With his finger he marks out a groove in the stone table. It is the popular king who sits there, once the ruler of three kingdoms, the friend of the citizen and the peasant. It is Christian the Second. Enemies wrote his history. Let us remember his improvements of seven and twenty years, if we cannot forget his crime. A ship sails away, quitting the Danish shores. A man leans against the mast, casting a last glance towards the Island Hueen. It is Tycho Brahe. He raised the name of Denmark to the stars, and was rewarded with injury, loss and sorrow. He is going to a strange country. "The vault of heaven is above me everywhere," he says, "and what do I want more?" And away sails the famous Dane, the astronomer, to live honored and free in a strange land. "Ay, free, if only from the unbearable sufferings of the body!" comes in a sigh through time, and strikes upon our ear. What a picture! Griffenfeldt, a Danish Prometheus, bound to the rocky island of Munkholm. We are in America, on the margin of one of the largest rivers; an innumerable crowd has gathered, for it is said that a ship is to sail against the wind and weather, bidding defiance to the elements. The man who thinks he can solve the problem is named Robert Fulton. The ship begins its passage, but suddenly it stops. The crowd begins to laugh and whistle and hiss—the very father of the man whistles with the rest. "Conceit! Foolery!" is the cry. "It has happened just as he deserved. Put the crack-brain under lock and key!" Then suddenly a little nail breaks, which had stopped the machine for a few moments; and now the wheels turn again, the floats break the force of the waters, and the ship continues its course; and the beam of the steam engine shortens the distance between far lands from hours into minutes. O human race, canst thou grasp the happiness of such a minute of consciousness, this penetration of the soul by its mission, the moment in which all dejection, and every wound—even those caused by one's own fault—is changed into health and strength and clearness—when discord is converted to harmony—the minute in which men seem to recognize the manifestation of the heavenly grace in one man, and feel how this one imparts it to all? Thus the thorny path of honor shows itself as a glory, surrounding the earth with its beams. Thrice happy he who is chosen to be a wanderer there, and, without merit of his own, to be placed between the builder of the bridge and the earth—between Providence and the human race. On mighty wings the spirit of history floats through the ages, and shows—giving courage and comfort, and awakening gentle thoughts—on the dark nightly background, but in gleaming pictures, the thorny path of honor, which does not, like a fairy tale, end in brilliancy and joy here on earth, but stretches out beyond all time, even into eternity! Add The Thorny Road of Honor to your own personal library.